It is true, the experiment has helped to undercut the ‘gilets jaunes’, but this movement remains volatile and could erupt again if people are disappointed by what Macron is going to do with the demands for tax cuts and better public services. 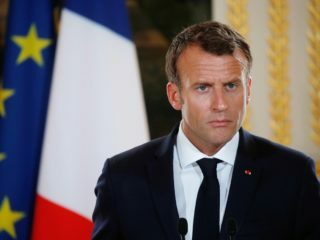 But also for more measures to protect the environment and a system of government that allows for direct participation by citizens.The government announced already to put cash in the pockets of everyday French citizens, including a boost to minimum-wage earners and cuts in taxes for some pensioners. The decree to freeze the state pensions for a period of two years has been reversed. After months of town hall debates across France, it is clear: the French people demands for tax cuts and better public services. At the end of last year, when the ‘gilets jaunes’ started their ‘revolution’ against the establishment, the French President had the idea that he could satisfy the dissatisfaction, especially in the rural areas, by organising a ‘great national debate’. However, Macron and his cronies underestimated the French. The President proved again that he, contrary to his predecessors, is completely out of touch with the French people. They saw Macron’s debate as a diversion. At the end of the debate, people are asking exactly what the ‘gilets jaunes’ asked already in November: tax cuts and better public services. It is true, the experiment has helped to undercut the ‘gilets jaunes’, but this movement remains volatile and could erupt again if people are disappointed by what Macron is going to do with the demands for tax cuts and better public services. But also for more measures to protect the environment and a system of government that allows for direct participation by citizens. The government announced already to put cash in the pockets of everyday French citizens, including a boost to minimum-wage earners and cuts in taxes for some pensioners. The decree to freeze the state pensions for a period of two years has been reversed. The litmus test for Macron will be the elections for the European Parliament, the end of May. His party, La Republique en Marche, fights a neck-and-neck race with Marine Le Pen’s Rassemblement National. It could cost the President’s party several seats in the EP at a time when populist parties are gaining traction across the continent. It looks like, that after Hollande and Sarkozy, Macron will be the third one-term French president in a row. The French who are old enough to remember him, are still thinking with nostalgia of the days of President Jacques Chirac, the last real French President.